Sometimes my inspiration for a theme for Ten on Tuesday comes in the middle of the night. Such is the case this week. Our topic, 10 Things On Your Bedside Table, came to me one night as I reached for something essential. Let us begin. A lamp. The one I have is pretty but doesn’t throw a great amount of light. I ought to consider buying something a bit better. Ear plugs. My husband snores. ‘Nuff said. A glass of water. I can’t make it through the night without one. My Kindle. It is essential that I read before falling asleep. Books. It’s not all about the Kindle, I do still check out books from the library. Aveeno. I slather it on my hands and feet before bed. Tissues. I think this is self-explanatory. Blistex. I already told you this one but it bears repeating. My iPhone. You just never know when you might want to check Facebook in the middle of the night. Also, I’m the mother of a college student. ‘Nuff said, again. The TV remote. 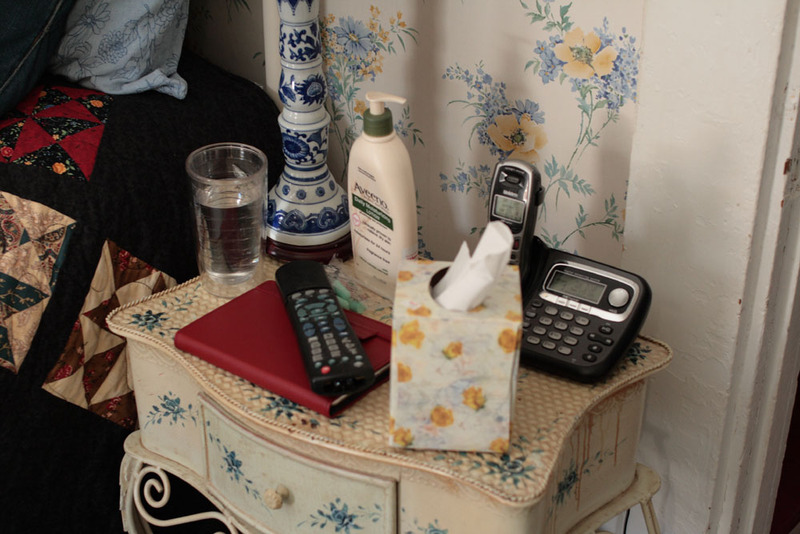 I don’t watch TV in the bedroom very often but the remote still lives on my nightstand. And that’s about it. All the essentials for entertainment, comfort and a good night’s sleep. Definitely have 1,3,5,7. In fact books take up most of the space on the lower part of my bed stand, most of them swapped with my mom and friends. I also have a journal of the books I’ve read. I was much better at writing about my reading when I was teaching. I did share my journal with my class to encourage them to write about their reading. Then when I retired I just got lazy about writing. My intention is to get back to this practice! 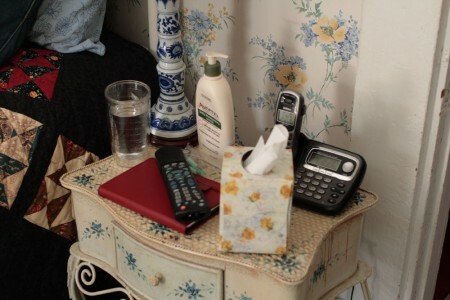 fortunately, my husband has the “real” nightstand that keeps the phone, the remote and the tissues. and I have a recessed lights above the bed so no need for a lamp. otherwise, our lists are about the same – books and lotions! It’s practically Spartan next to mine! Your nightstand is SO pretty! I’m having lamp/light issues, too. Someone needs to make a small, pretty lamp that sheds the perfect amount of light. Or someone needs to tell me where to find said lamp!! Our nightstand “collection” seems very similar! I might have to try the ear plugs — my hubby snores quite a bit too and my sound machine has not always been enough! Happy tuesday! Have you really checked Facebook in the middle of the night? I’ll have to remember that for times I can’t sleep. Hmmm. I guess I need a “twenty three things on your nightstand” list. Our bedside table junk is much the same, but I have no i-anything. I love my alarm clock even though I never use the alarm. I don’t have 1 (floor lamp instead), 9, or 10 but the rest are the same! I also have a stack of vintage Gourmet magazines on the floor that am slowly going through. Not technically on my nightstand but part of the bed accessories if you will. i have a lamp, lip balm and hand cream, a book and iphone. i’ve been curious about ear plugs and the snoring spouse – just hung up on the fact that i might not hear my kids in the night if they wake up sick. My nightstand (I wrote bookstand) is actually a dog crate. Victor doesn’t sleep upstairs, because he whined too much for the cat. So, instead he sleeps in his downstairs crate and I use the top of his crate for lotion, books, a light, more books, some random clothing, even more books, and some random plush microbes. I didn’t want to take a picture, because it is a mess! Mine is small and has just a lamp (also very dim due to the “econo-crap bulb DH installed- grrr…), a Jane Brockett doll named Lavinia Joyce, a small square enamel tin with spare change and my CPAP machine. DH has all of the other goodies on his. And a glass of water? That would be spilled in a nano-second here. Your night table is way prettier and ess cluttered than mine but we’ve got some of the same things on them. I forgot to list my cellphone which is usually on my nightstand too. Because of the daughter, you never know.